Is there life on the red planet? Could you colonise it? Inspire students across the curriculum with our lesson resources. Mars has been the subject of human fascination for a long time, and we’re closer now than ever to sending humans to explore its surface. With the revelations that there could be flowing water (and possibly life) on it – and the release of Matt Damon’s new film, The Martian – now is a great time to engage your students in the red planet. Here are some out-of-this-world lesson ideas to help you. Challenge children to find out where Mars sits in our solar system with this wall chart and poster planet guide. Once they’ve located it, set your young astronauts a mission to find out more: how far is Mars from the sun? How many moons does it have? Students can record their ideas in this Mars-themed log book with from Twinkl. With the basics covered, you can compare Mars with Earth using this poster from Nasa. What similarities and differences can they find? There are variety of classroom activities to keep young minds interested, including making a model of the solar system using coloured beads and an explanation of how to calculate the distance between the two planets. Step into the unknown with Mars Adventure, an online group problem-solving exercise that gives students 10 minutes to select 10 items they would pack for a journey to the red planet. Points are awarded for the suitability of each item, with a final score revealed when the rocket is ready for blast off. But what is life like when you get to Mars? This resource on building a space habitat has been designed to get students thinking about their needs and how these could be met so far away from home. In groups, ask your class to consider what kind of structure they would opt to live in – a geodesic dome or an inflatable habitat? Get them to list the features it would need to have and produce a labelled diagram before building a model. Once they’ve set up camp, students can share their ideas about life on the red planet by writing a postcard from Mars. This space-themed word search offers handy keywords and these images from Mars will help pupils create an image for those at home. The could also draw a picture of a martian and use it as a stimulus for creative writing. On the literacy theme, these differentiated worksheets and PrimaryLeap’s reading comprehension task are both useful for rounding off the topic and encouraging language skills. For a more hands-on activity, this engaging balloon-based engineering activity gives a basic introduction to space travel and involves sending different rocket designs shooting along a fixed line. Mathematicians might also enjoy some logistics analysis. It costs more than £10,000 to transport 1kg to the International Space Station (with shuttles usually carrying an average of 26,000kg of cargo plus astronauts). The cost of transporting goods to Mars would be even higher – can older students think about budgets? Finally, primary teachers may also be interested in the Astro Science Challenge, a free, six-week interactive science project running throughout the autumn term to celebrate Tim Peake, the first British European Space Agency astronaut to visit the International Space Station. 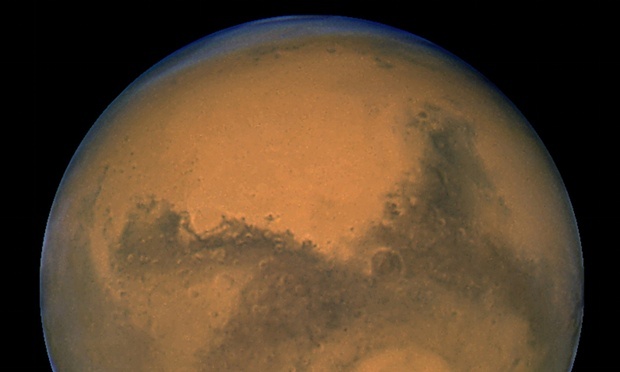 The recent news confirming liquid water on Mars is a great way to engage older students in the red planet. The discovery has brought the prospect of human settlement a step closer, but is colonisation of the planet a good idea? This report from The Day explains the latest findings and offers ideas to stimulate debate. Further articles about India putting a satellite into orbit around Mars and 20,000 people signing up for a trip to the red planet are also great prompts for discussion. Life on Mars is the focus of Ridley Scott’s new film, The Martian, which tells the story of a scientist who is left behind during a mission to the planet. The official trailer (below) is a useful prompt for your class to discuss whether they would be willing to volunteer for the mission. The film has the tagline: “Help is only 140 million miles away” – how does this make students feel? And as an extension task, this Guardian article explores the scientific accuracy of the film. IntoFilm also looks at the science behind The Martian and encourages students to scout out other films set in space, such as Interstellar and Gravity. In the 50 years that Nasa has been sending robotic missions to Mars, the landing craft have become increasingly sophisticated. As a design and technology task, challenge students to plan and build a robotic rover capable of navigating the rocky surface of Mars. If your students want to try something more creative, they couldcompose a piece of Martian music, inspired by the European Space Agency’s new theme tune. It was composed by 17-year-old Gautier Archer and was praised by judges for capturing the spirit of space exploration. The MARSBalloon project is an exciting opportunity for students to send a capsule 30km into the Earth’s atmosphere, where the air pressure, temperature and radiation are very similar to the surface of Mars. The aim is to test students’ ideas for technologies that could one day be destined for the red planet. Keep an eye on the project’s website for details of the next launch. For the more artistic students, Mars missions have produced a wealth of amazing images – you can use these to inspire students to create a piece of Martian art. There are a variety of techniques you can try to suit different age groups, such as raking patterns in trays of sand; building up oil paints on canvas; blowing bubbles of paint on to sugar paper; or creating wax crayon rubbings. For more ideas, see these How to teach... articles about the solar system and space travel.